Tingi-tingi culture is a way that small shops in the Philippines respond to the economic parameters of their community. Find out more about this cultural adaption. Published on January 7, 2013 by Apol Danganan Follow me on Twitter here. You run out of cigarettes and you badly want to smoke but you are at home and too lazy to go to the supermarket. What would you do? In the Philippines, people can just go to the nearest store and buy a stick. A stick? Yes, a stick or two. 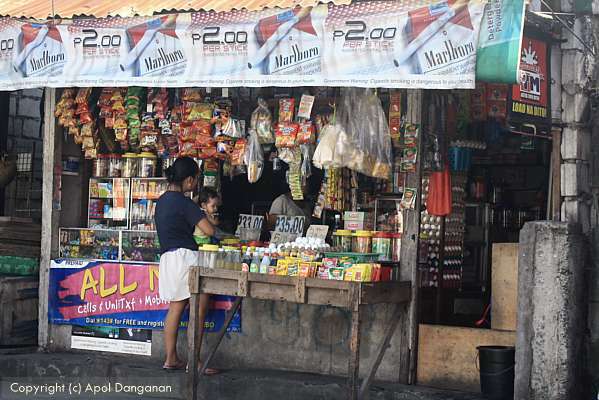 Especially now that the Sin Tax Bill has been signed into law, imposing higher taxes on alcohol and tobacco products, it is anticipated that more Filipino smokers will resort to buying cigarettes by the stick rather than by the pack. A lot of them will even be forced to lessen their usage or even quit. I sat with a cigarette vendor last week and had a little chat. 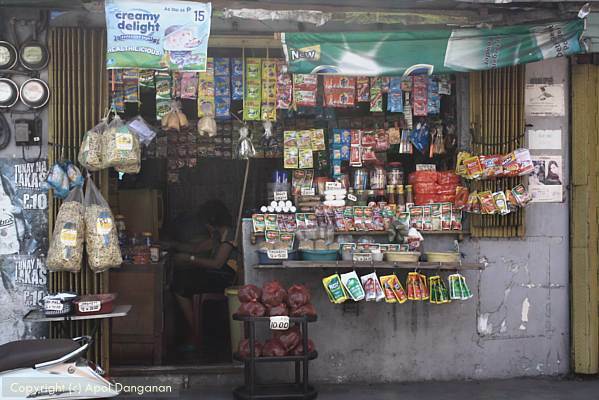 The exact spot where he sells candies and cigarettes is the same spot where he and his wife sleep every night. I initially addressed him as Tatay (father in Filipino) and through our conversation I learned that his name is Jose. 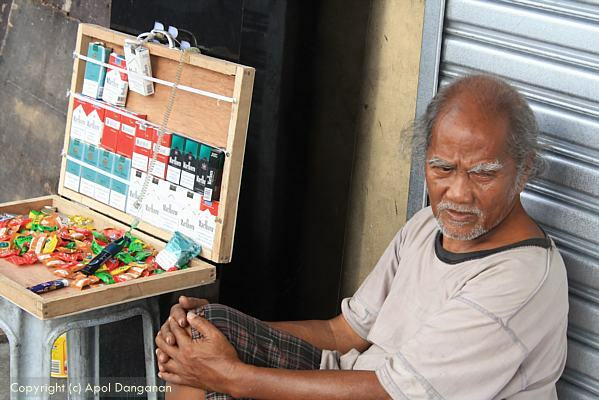 He is 66 years old and his main livelihood is selling cigarettes. He can no longer do heavier jobs because he had two operations due to some kidney disease. His wife is 50 years old and works as a sweeper at a park. Their kids live around the area and are quite dependent on them. The most he could earn everyday is 100 pesos. He buys the cigarettes in a store around the corner that had already increased the prices due to the new law so he had to hike up his prices as well. I continued chatting with Tatay Jose asking him about his family. He was very respectful in answering my questions. What really impressed me was his usage of “po” in each sentence. Po and opo are words used by Filipinos to show respect to other people, especially elders. It was very unusual for me to be addressed like this by an old man. I felt so humbled. During our conversation, two customers bought one cigarette each at different times. It was pretty obvious they were old customers.They just placed 3 pesos on the board and took a stick on their own. The 1st customer claimed it was only 3 pesos the day before and Tatay Jose told him that the price had been 4 pesos for a week. The 2nd customer was more respectful; he just said alright and added another peso to his payment. This style of buying is prevalent in the Philippines. This is brought by the Filipino culture of tingi-tingi, or retail, which mirrors the financial status of most of the people in this third world country. 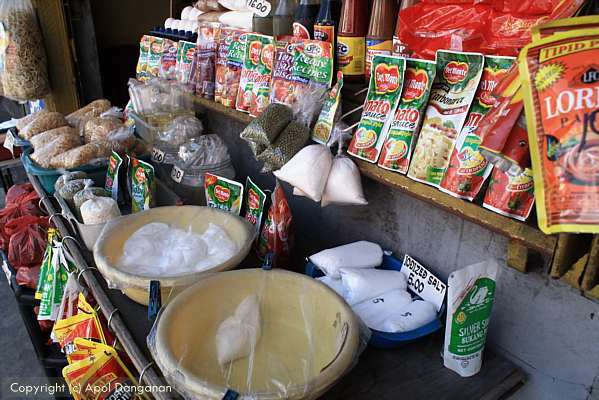 Not all consumers can afford to buy products in bulk, so this tingi-tingi culture is a way that people can buy units of an item rather than the entire pack. 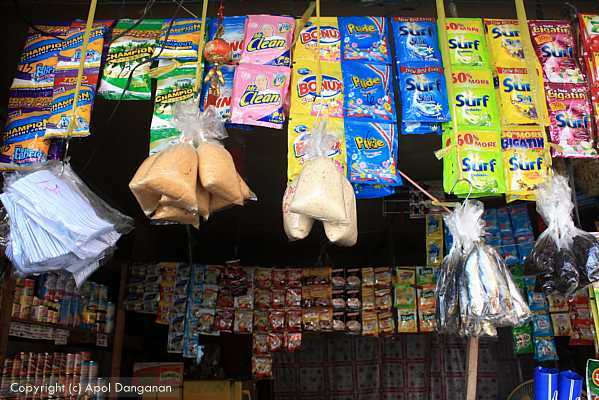 Scattered around the Philippines are sari-sari (variety) stores that sell the basic stuff for the daily needs of the locals — sachets of shampoo, toothpaste, laundry powder, coffee, milk, soy sauce, vinegar, tomato sauce, even repacked salt, sugar, cooking oil, macaroni and charcoal — in smaller quantities than the original packaging. When there was no cheese in packets yet, they even sold it by slices. Cigarettes are even divided up and reassembled in smaller quantities in sachets — yes, vices in micro packaging. Even 10-peso cellphone credits are available too! It may be financially unwise to buy a sachet of shampoo everyday versus buying a bottle of shampoo for much longer use and cheaper cost in the long run, but most people only live on what they can afford each day. What I find beneficial is with this style of buying you can get only what you intend to use or limit your usage because you have only a little. In some ways, people get to save money by not wasting away quantities they don’t need. 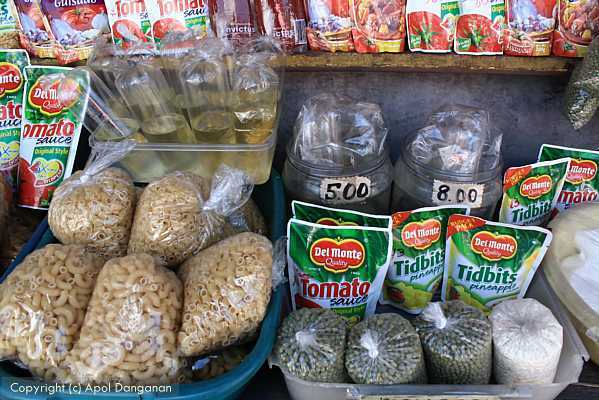 Even if malls abound in the Philippines, these sari-sari stores thrive everywhere in the country. Big or small, they are always there. There’s one on almost every street, sometimes even more than one, to cater to the needs of the locals. 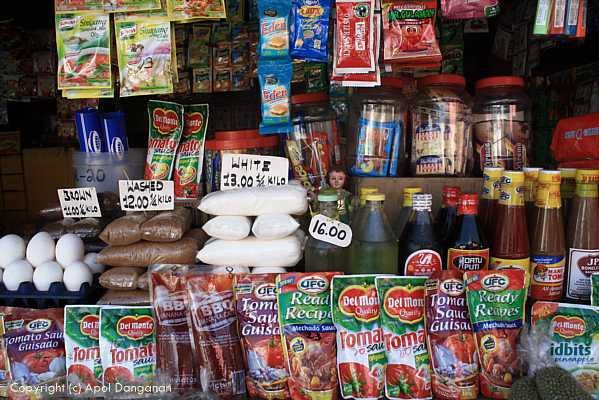 Even those who can afford to buy in larger quantities, when they run out of something they can just go out of their house, choose a nearby sari-sari store to buy from, and get what’s needed. In the Philippines where everything must come small, this tingi culture definitely is one tactic to survive each day. @yuhum_yuhum It’s good to know that this custom has a name. I never really knew what to call it before. Thanks for the information and excellent story. yuhum_yuhum It’s good to know that this custom has a name. I never really knew what to call it before. Thanks for the information and excellent story. Thanks Wade! 🙂 Tingi tingi buying is a big help for us… esp those who live in very remote areas. @yuhum_yuhum Yes, I also like the live for today rather than hoard for tomorrow mentality. It’s also good for travelers, as we don’t need to carry large portions of items around with us all the time.